It was an early morning on Tuesday. 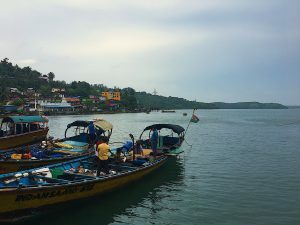 At 6:45 AM, we arrived at a fish landing on the Andaman Islands. Walking down the crowded landing, I woke up to the smell of fish carried by the warm breeze. 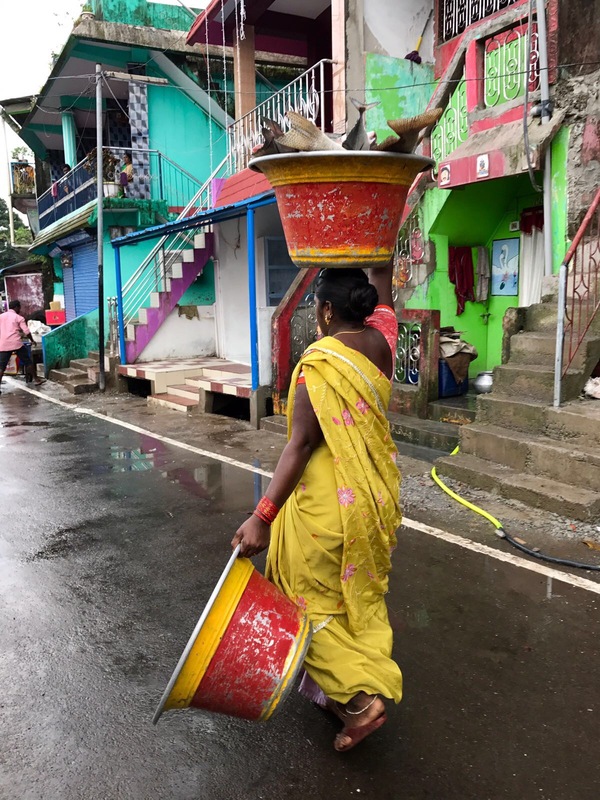 We passed by women with baskets full of fish balanced on their heads. Autos drove by with more carts of fish, and people hovered around the arriving boats. The fishermen pulled out a variety of different fish from the buckets, including stingrays, small sharks, groupers, barracudas, jacks and red snappers. There were two different types of boats at the landing: long-line and trawlers. After we finished viewing the landing, we went to observe the fish market. Unlike the landing, the fish market was dominated by women. While it seemed that only men caught the fish, women were the ones who dealt with the fish once off the boat. At the fish market, two rows were created with women cleaning the fish and bargaining with potential buyers. 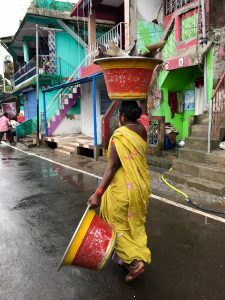 A woman carrying a basket of fish on her head in Port Blair in the Andaman Islands, India. Photo by Sophia Pessagno. This experience exposed me to some of the components that constitute the fishing industry. The types of fish being caught, human interactions within the fishing community and the government policies in the country all shape whether fisheries are sustainable or not. Once the fish reaches the plate, people rarely consider the series of actions involved in getting the fish there. How does one know whether or not the fish s(he) is eating is sustainable? Mahima Jaini, a marine researcher at ANET (Andaman and Nicobar Environment Team), explained to us that by examining the various processes in fisheries, we could get a better understanding of healthier fish consumption practices. However, the complexity that occurs inside of fisheries makes it difficult to produce one perfect solution. Examining the biological characteristics of different fish species can create sustainable fishing practices. Different fish have varying biological characteristics, such as the age when maturity is reached, the number of offspring produced, the frequency of reproduction and the size of each fish. All of these characteristics influence how much each fish species can be caught without being detrimental to its population size. Besides the biological characteristics, the different fish species interaction with the rest of the ecosystem needs to also be investigated. How will the removal of one species affect the rest of the ecosystem? This question introduces the concept of trophic cascade. Trophic cascade occurs when there is an elimination of an entire trophic level. At the bottom of the trophic ladder, there are the primary producers whereas predators are at the top. There are other levels between these two, including herbivores. Certain types of fish have higher market values than others, which influences the amount of capturing that is done for a specific fish. Fish species that are higher up on the food chain tend to be overfished. The overfishing of predator species in the fishing industry has caused a disruption in the dynamic equilibrium in marine ecosystems. With less predator species in the ecosystem, other trophic levels have experienced population growths or declines. A view of the fish landing in Port Blair in the Andaman Islands, India. Photo by Hannah Metwally. In general, people lack the interest and time to learn the biological characteristics of each fish they eat. There are a few quick ways in which people can educate themselves on the types of fish that they are consuming. Downloading apps on cellphones, such as Seafood Watch, can act as a helpful tool in reducing environmental impacts. Seafood Watch is a program that has created an easy app for consumers to use. In this app, consumers can search different types of fish, and the program will make a suggestion on whether or not they should eat that particular fish. By using this app, consumers can make informed decisions in just a matter of seconds. Mahima mentioned a another program called Know Your Fish. This program is led by a group of researchers who supply the public with seafood recommendations that encourages sustainable eating practices. These recommendations are based on a couple of factors. The Know Your Fish website advises people against eating fish during their youth and breeding period. It also cautions people to prevent collateral damage to other marine species. These researchers have taken into account the biological characteristics of different fish, so now consumers can use this information to make smarter choices. Fish caught on the landing in Port Blair. Photo by Emma Wetenhall. Another factor that affects sustainable fishing is the humans involved in the industry. Each person working at the fish landing that I saw on Tuesday were all part of the market dynamic that happens in fisheries. Each have their own unique role in handling and transporting the fish to its destination; the fish industry has a lot of middlemen. But, what are the backgrounds of the people working in the industry? The cultures of small fishing communities are influenced by the climate in that region, the type of marine species living in the nearby waters and the availability of certain fishing gear. For example, fishing communities in tropical waters will use different fishing techniques to catch the specific marine species living in that area compared to fishing communities in temperate waters. However, small fishing communities are often connected to other cultural systems. Mahima told us that many people migrate from the southern state of Tamil Nadu to the Andaman Islands. Natives and immigrants living in the same fishing community may have conflicting values because each is accustomed to their own regional practices. 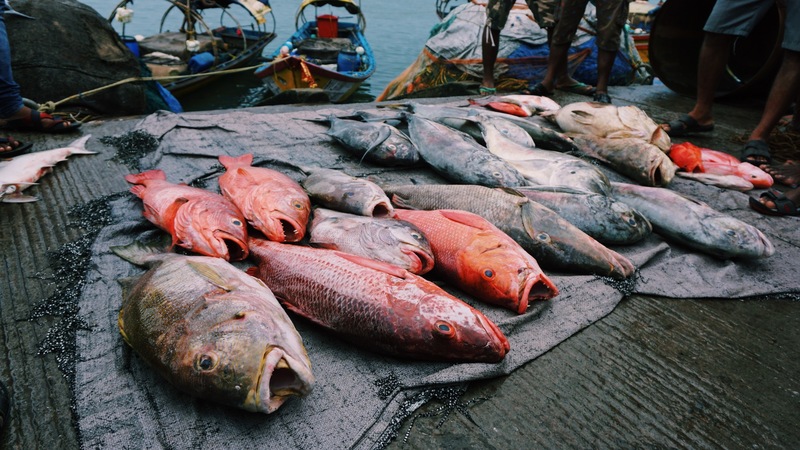 Since the fishing industry is one of the most globalized economic sectors, local fishing communities have now become more involved with international trading, which also shapes cultural attitudes toward fishing practices. One possible step toward healthier fishing practices is community-based management. While some community-based management efforts are driven by conservation concerns, many fishermen in small communities are primarily concerned with property rights. To ensure that fishing competition is kept to a minimum, many communities will strive for the elimination of outsiders into the area rather than create sustainable fishing practices. There are many working forces that mold the mindsets of those in the fishing community, making sustainable fishing no easy fix. 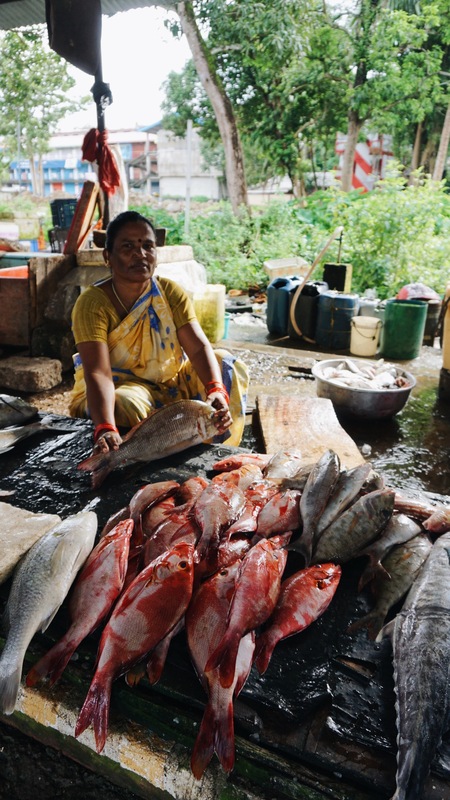 A woman selling fish at the market in Port Blair. Photo by Emma Wetenhall. The government also plays a crucial role in a country’s fishing industry by passing various policies, which can either help or hinder marine ecosystems. 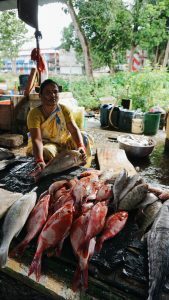 The Indian government subsidizes much of the fishing industry as a way to boost the economy. According to National Fisheries Development Board, an administration under the Indian government, the fishing industry serves as employment for 14 million people in the country. In comparison to the rest of the world, India is ranked third in fisheries, and 1.1 % of the country’s GDP stems from the fishing industry. Yet, rarely is this government funding used to monitor these fishing activities. As many lecturers have mentioned during my stay in India, the country has many regulations in place to support environmental efforts, but these policies usually have little impact due to the lack of enforcement. There is also the problem of a variation of laws related to fishing and aquaculture because each state legislature has power to make its own laws on fisheries as stated in the Indian constitution. The main government law that applies to all of the Indian states is the Indian Fisheries Act of 1897. This law forbids the use of explosives or poison to catch fish, and any caught person will be penalized. Other laws, such as the Water Prevention and Control of Pollution Act of 1974 and the Wildlife Protection Act of 1972, also were introduced in attempt to save marine ecosystems. Mahima informed us that the government provided tremendous aid to the fishermen in the communities after the 2004 tsunami hit the Andaman Islands. People had more boats after the tsunami than they did before. While this support was able to give relief to many people, it only sped up the destruction of ocean life. Many politicians encourage the exploitation of ocean life because of the easy vote that it gives them. Fishing is already a challenging occupation, so putting restrictions on these fishermen steers them away from electing those politicians. Politicians are also primarily focused on the economic status of the country. There needs to be more research and concrete data on how environmental damages threaten the nation’s GDP. Without these numbers, government intervention is highly unlikely. Government corruption makes solving the problem of unsustainable fishing a daunting task. Overall, there is no quick fix on how to obtain sustainable fishing practices, but there are small steps that can be taken by the individual. Attempting to change the traditions of fishing communities and the motivations of politicians is an unending battle. However, fish consumers can take simple actions, such as downloading an app onto their phone, to be more aware of the impact that their decisions make. 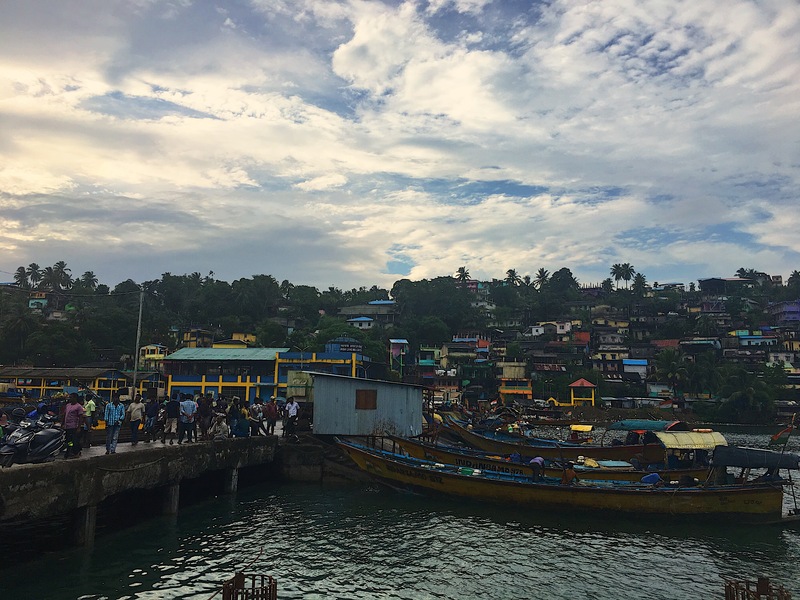 The fishing boats in Port Blair. Photo by Hannah Metwally. Jaini, Mahima (2017) Fisheries. Lecture, Andaman and Nicobar Environmental Team. 17 October 2017.